Watch out. It appears GPS watches are here to stay. 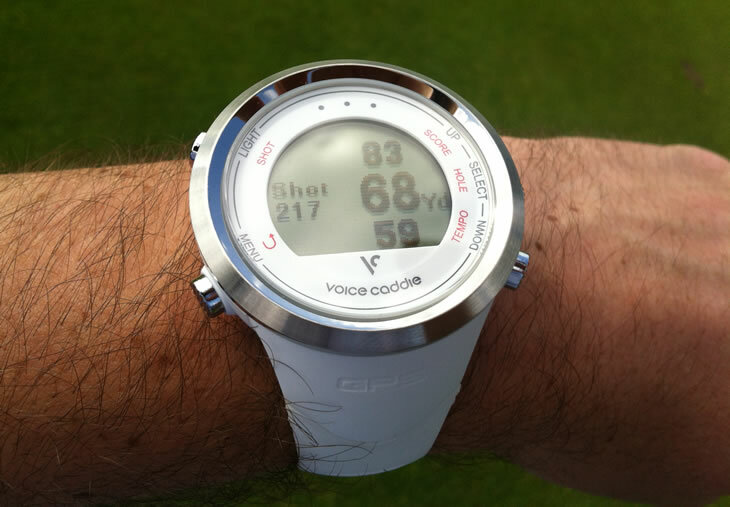 Whilst some predicted the golf GPS watch would be a here-today-gone-tomorrow fad, golfers and companies appear to be investing in the technology. Designed to give you accurate, quick yardage information, GPS watches now come in a variety of shapes, sizes and colours. 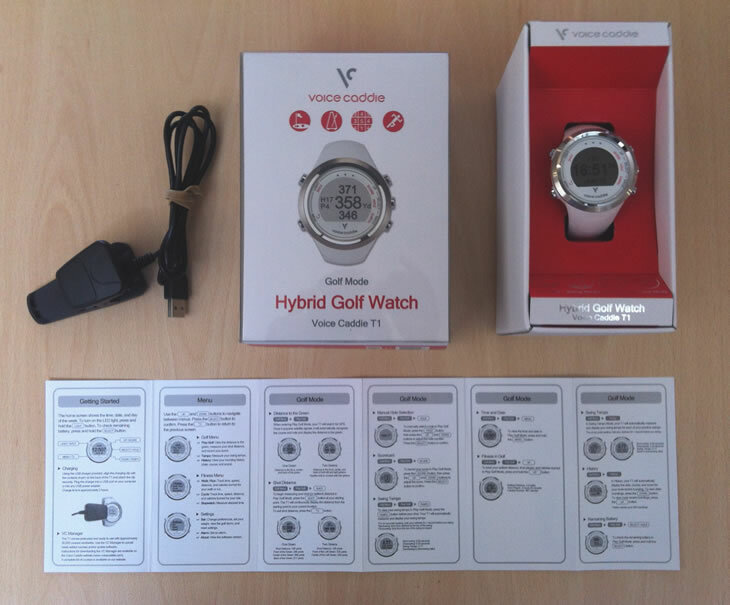 Voice Caddie sent us their latest Hybrid Golf Watch, the T1, and I took it out on the course to see how it performs. Whilst many may not be familiar with Voice Caddie, the California-based company has been around since 2005. They have a range of interesting golf gadgets and the T1 is their first GPS watch available in the US and Europe. Available in white or black, the T1 is more than just a yardage device. It can keep your score, measure shot distances, track runs and cycles, calculate calories burned and even help tune your swing tempo. Taking it out of the box for the first time, I was impressed with T1's clean, modern looks. The white strap and face are complimented with shiny, chrome edges that make the T1 look more like a typical watch than some other GPS watches on the market. First things first, I needed to charge it up. 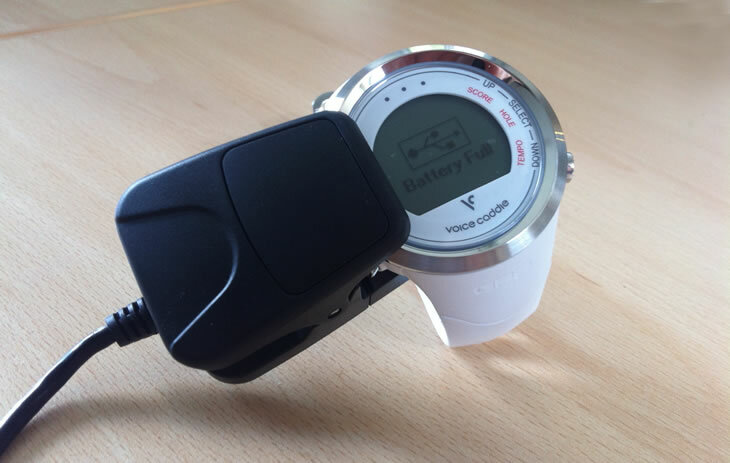 Like most GPS watches, the Voice Caddie T1 uses a 4-pin charging system on the back of the face. To charge it, you need to clip on this cable and connect to a power source via USB. The charging cable looked like it was taking the pulse of the watch and was a little awkward to plug in and store compared to simple plug adapters you find on any smartphone or handheld GPS device. Regardless of that, it took about 90 mins to charge to full battery and Voice Caddie say fully charged it will last about 10 hours in GPS mode and 6 weeks in the non-GPS mode. The problem many companies have is packing all the technology and battery power inside a device that is comfortable and easy to wear and swing with. 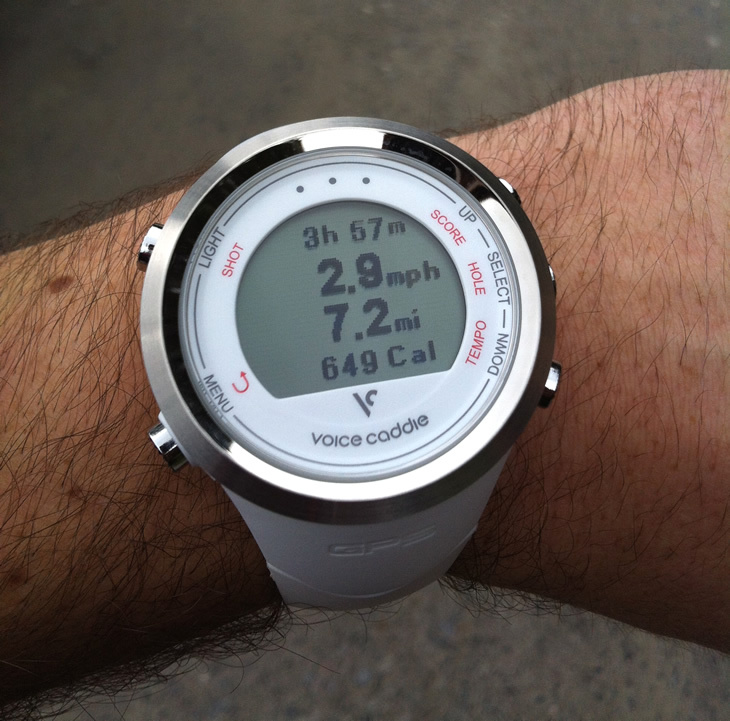 At 62 grams, the T1 is on the heavy side of the GPS watch market, and is also one of the largest. As someone who doesn't tend to wear a watch on the course, I found it pretty hefty on my wrist. 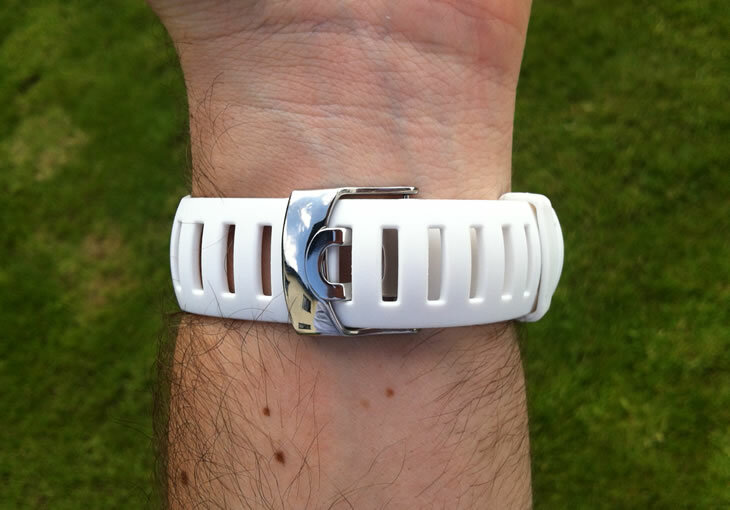 The T1 is secured using a classic watch strap that was secure and very easy to fasten and remove. The strap is a thick rubber material that has some flexibility to it, but did seem to trap heat and sweat. With all the features packed into the device, it is vital that the T1 is easy to use and navigate. The watch features five, large metal buttons on the exterior. They may look large, but they were easy to find quickly and click, unlike some smaller, more subtle buttons. With the watch secured on my wrist, it was time to find my course and begin my round. The T1 has access to more than 30,000 courses straight out the box, with no need for downloading information before your round. Finding a course was easy. Simply select "Menu" by clicking the bottom left button, then choose "Play Golf". The T1 then searches for the course you are at and directs you to proceed to the tee, where it then shows your the hole, par and distances to front, middle (bigger text) and back. The whole process and search took about 20 seconds. With all three distances showing and updating live, it was easy to glance at my wrist and see what I, or one of my playing partners, faced into the green. The distances were easy to read, easy to understand and accurate. Voice Caddie say their yardages are typically accurate to within 3 yards, which is fine for the average golfer but may not be quite sharp enough for the competitive, lower-handicap player. I have to say during my rounds with the T1 I found it very accurate and reliable, and it also helped me play quicker without the need to walk off or laser distances. I could see myself using a device like this in bounce games. It would seem a waste if the T1 has all that GPS technology and just offered distances to the green. For that reason, the T1 has a host of other features. For example, the shot distance measurement. To measure a shot, I clicked the top left button to begin the distance tracking. The measurement then replaces the hole number and par on the left hand side of the face and increases as you walk towards your ball. The distance is measured in a straight line from the point you clicked "Shot" and therefore won't skew the distance if you walk offline or help a playing partner search for their ball. Whilst there is no way to save the distance once you've measured it, it is a good feature to understand how far you hit a shot or measure a particularly good drive. Whilst measuring your distances may not be all that important, measuring your score is. The T1 has a simple scoring system that you access by clicking "Score" via the top right button. Simply add shots using the up and down buttons and the watch will edit your score and show whether it was a birdie, par or worse. I found the scoring useful and easy to use at first, however it soon began loosing track of which hole I was on and I found it hard to navigate to the correct hole. Once I got the hang of it, it was fine, but it will take a couple of rounds to get used to. Also, it only lets you track one score. I would have liked the ability to track scores for multiple players. 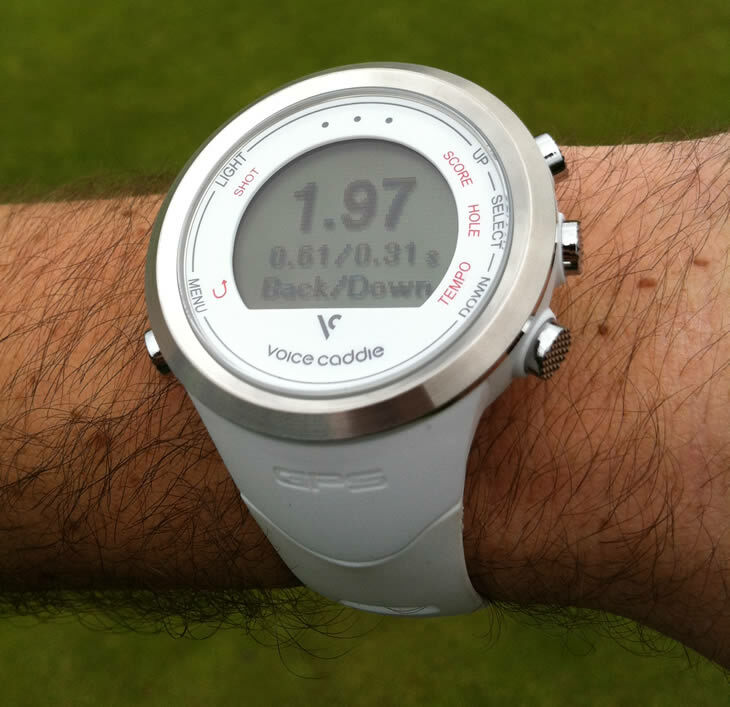 Surely it wouldn't be hard to add multiple golfers and even manage your game or bets using a GPS watch? Another aspect of the scoring feature is the ability to store your rounds. Having played a couple of rounds, I was able to go back and see the date, course and score of each round I had played. It would be nice if this information was available to store online as I can't imagine anyone would go back and scroll through past rounds on the watch. One feature on the T1 that I haven't seen in a GPS watch before was a Swing Tempo gauge. 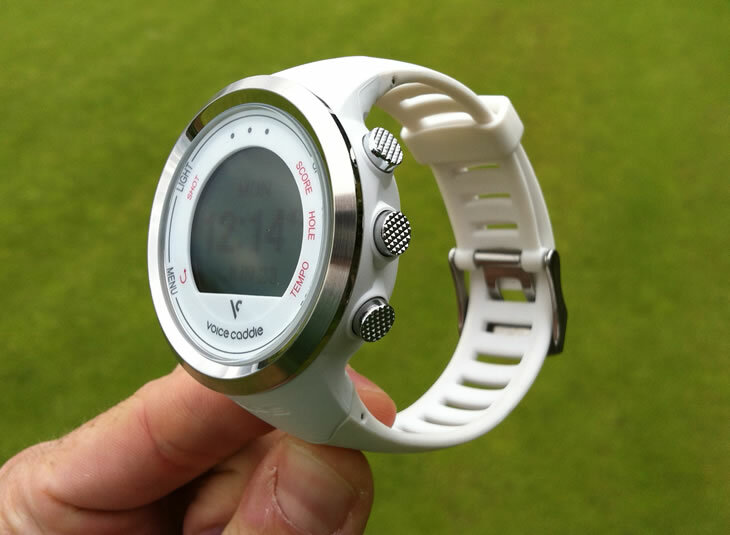 As the watch is able to read its location and obviously track time, Voice Caddie have combined the two to offer the ability to measure your swing tempo. Select "Tempo" from the golf menu and the T1 will begin measuring your swings. The instructions suggest you pause for a couple of seconds before swinging. After each swing, the speed of your backswing and downswing are displayed, along with a ratio of the two. Whilst I'll admit this feature did sound a little gimmicky, it was actually quite fun to use. It would be a good tool to use on the course, perhaps with practice swings. You could find a good rhythm and then try and replicate that with your shot. Only problem, you can't easily switch between Swing Tempo mode and Golf mode. You have to exit one, before starting up another. However, before my second round with the device I used the tempo mode on the range to ensure I was swinging smoothly and consistently. Having read that a 3:1 ratio is ideal, I had a fair bit of work to do! 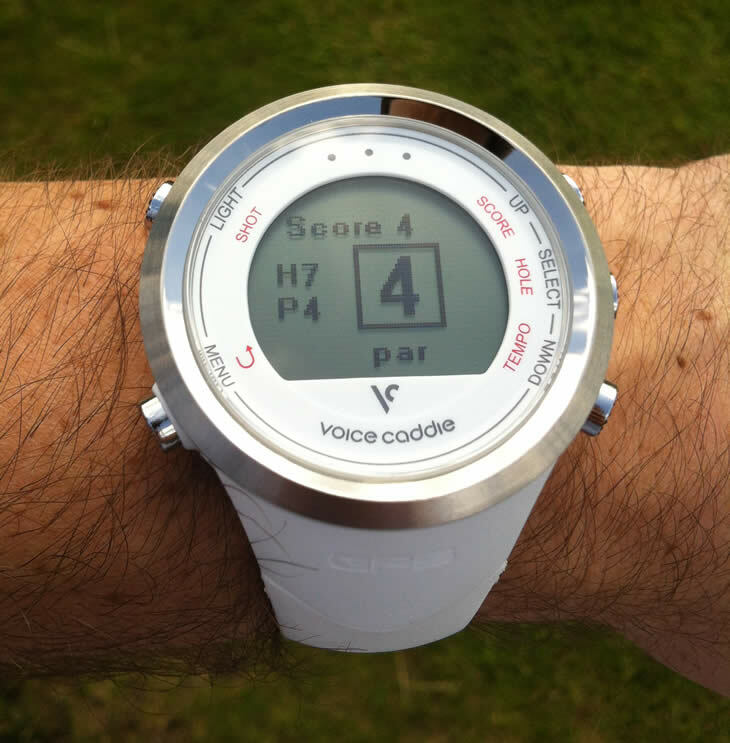 As I said previously, with all that GPS and timing technology in the watch, Voice Caddie are able to offer a number of add-on features. Another example of this is the ability to track walks, runs or bike rides in the T1's Fitness mode. Having entered my weight ahead of time, I used the watch to measure a hill walk. The T1 displays your time, pace, total distance and an estimated calorie counter. It was cool to measure the walk, but it was fairly basic. When in "Walk/Run" mode you can't see the time without exiting the tracking and loosing the activity. It would have been good to see the actual time of day during the walk. Also, the calorie counter clearly doesn't take into account increased heart rate from elevation. 649 calories for a 7.2 mile walk up a 1,100m high mountain? I think not. As an indication of the battery life, this walk used up almost 50% of the battery in GPS mode. 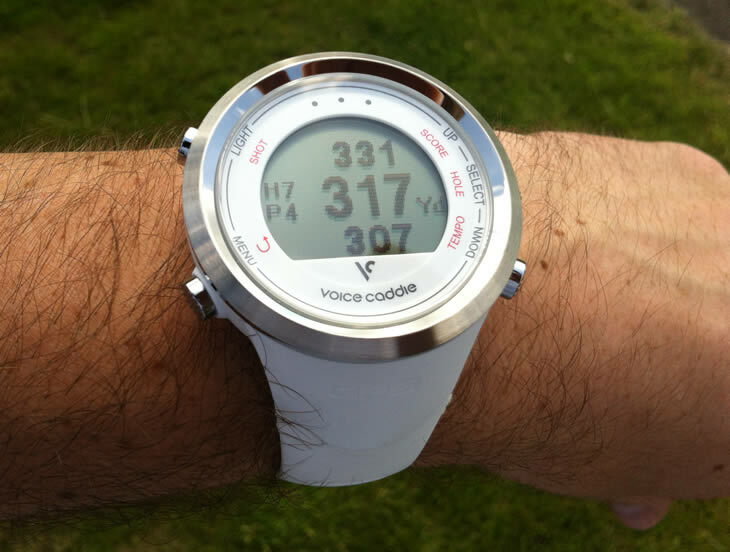 All in all, the Voice Caddie T1 is a cool-looking, simple GPS watch. It doesn't offer much beyond what is already on the market, but as far as ease of use and yardages go, it was good. Having used it a few times, I felt it lacked any real, innovative add-on features and was a little bulky and heavy for me. However, if you just want a watch to show you distances, and don't mind the size on your wrist, I doubt you'll be disappointed. I have had a Voice Caddie T1, for 18 months and over the last 6 months the watch will only charge to 45% meaning that its runs out before you finish a game of golf. I have tried downloading updates but still the same and I can't seem to find a UK number to speak to some one about this problem. Will have to look for a different make to purchase. I was disappointed with my purchase of the T1 Hybrid. In August 2016, the wrist band broke at the flex point and can't be repaired. I call Voice Caddie to see if the face could be placed in another band and they said "no". In the summer of 2015 we went to Sunriver in central Oregon. The three courses there have been in existence for over 20 years. The GPS measurements were accurate but the par and hole numbers were wrong. If you go to an unfamiliar course, be sure to check the hole # and par against the card. I called Voice Caddie to advise of the error in information and was told to download the stats from some internet site. I can understand if the course is a couple years old but on courses that are over 20 yrs. old the information should be correct when purchased. I usually walk the course but when in a cart, if I rest my palm on the seat, flexing my wrist, one of the buttons would get pushed and the menu would change. I had a heck of a time resetting to the current time. Too many steps so I kept a photo copy of the instruction guide in my golf bag. This spring I plan to purchase the Garmin Approach S20 as several of my golf friends have and love it.